Dear teachers and students, the purpose of this study is to manufacture auxiliary material that would help teachers from different areas of expertise, especially in vocational schools, utilize informational technologies efficiently during their lectures. This study has been produced as an intellectual outcome of the Peace with ICT Project that is coordinated by Provincial Directorate of National Education of Van, Turkey. 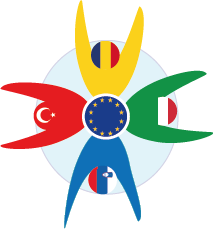 The other participants of this study, which are as follows: Mehmet Erdemoğlu Vocational Highschool, Yıldırım Beyazıt Vocational Highschool, Yüzüncü Yıl University, Mircea Scarlat of Romania, Grm Novo Mesto of Slovenia and IFOA Institution of Italy, have actively contributed to this study. All the institutions that took part in the preparation of this book are carrying out researches to increase teacher qualification standards in Europe as well as to meet their own countries’ needs. This project is also seen as an important stepping-stone for our institutions to fulfill their purposes because the information needed can be found on digital media and this informatics is brought to the individuals in question via digital devices. Not only in Turkey but also in Europe, there is a reluctance amongst teachers in using technology. Thanks to Peace with ITC Project, we, educational institutions from 4 different countries, work towards to get over this reluctance and to prepare our teachers to the digital age. It is an undoubtful fact that technology is an irrevocable part of education in this age of information. In order to catch up with the times and to integrate technology into education, many different studies and investments have been made. For instance, Project FATIH is being carried out by the Ministry of National Education of Turkey in order to enable teachers and students to utilize technology during classes. As a part of this project, all educational institutions are equipped with smart boards, computers and digital tablets. Again, within the scope of Project FATIH, thousands of teachers and administrative personnel have received various training. The reluctance to utilize technology cannot be rehabilitated just by introducing teachers to technology. Hence, it is necessary to make teachers love technology by means of various encouraging activities and to ensure them to use technology actively during classes as well. Peace with ICT Project is prepared to target this problem and carried out to overcome the reluctance of teachers to use technology. Google Earth: You may show many geographic regions that are impossible to reach to your students within the comfort of your classroom when you use it in your classes. This application can be used during classes especially by teachers of geography and cartography as well as teachers from various branches. TooNoisy: Many teachers might encounter several difficulties during giving their lectures. The most important of these difficulties is the noise that is created by students intentionally or unintentionally. Thanks to this application, the students will notice that the noise level is above acceptable levels with the warnings they receive from noise-meter. Even, some students might sometimes force others to stay silent with the help of this application. Video Use during Classes: Short videos can be prepared to brief about some subjects or to wrap the subjects up at the end of the class. Teachers themselves can make those videos or they can find videos related to the subjects on websites like teachertube.com and YouTube. Researches have shown that watching these kinds of videos or simulations develops students’ skills, such as memory, creativity, critical thinking and problem-solving. You can create a positive effect on students of today whose visual learning is quite developed when you use easy-to-access technology products such as these. Simultaneous Live Video Conferences: Instead of making students watch pre-prepared videos all the time, we may have an expert on a specific area give a lecture online. This expert can be a well-known figure on the subject or a colleague of yours who is teaching on the same subject at a different educational institution. The important thing here is the possibility of students acquire new ideas and extend their horizons. We can carry out the implications of this sort free via Skype and Google Hangout. Presentations: A text-only presentation is far from drawing students’ attention. However, if we integrate multimedia samples that might draw students’ attention, we can motivate them on the subject more efficiently. These multimedia samples can be as follows: pictures, graphics, pictograms, podcast clips, sound effects, short video lectures, news, movie fragments, music videos etc. Adaptable Contents: Current students, who are the digital natives of today, pass most of their time checking their smartphones and using the applications within. Why do not we, teachers, turn this into an opportunity and seize it to transform the situation to students’ advantage? For example, proper video lectures on VoGoP (Vocational Good Practices), the only free online education platform in Europe can be sent to students, and teachers can get students to study via their smartphones. Create Online Calendars and Publish Them: By means of online calendars that you publish, your students will be informed about the topics they are going to study beforehand, and they can come to the classroom prepared. You do not have to create a different software to do this. You can use Google Calendar in order to fulfill this task. After creating the calendar, you can inform the students as well as their parents about the activities to be carried out during the week by sending the link to the necessary individuals. Form Learning Stations: Form groups of students from 1 to 6. Prepare a different station for each group. There are different electronic devices on each station, and for every device, there are lectures on different aspects of the subject. Students learn all aspects of the subject in question after visiting all stations. Create After-Class Activities: The class can be ended 10 minutes before the usual time to receive feedback and criticism related to the subject from students. These comments can be shared via online notebooks or tweets under certain hashtags which include comments made on the online slideshows, after-class feedback (including both taught and untaught parts of the subject) and learning outcomes that they see fit. The teacher can have an idea of what is learned and what is not on that day by checking on students’ comments. Questions of students can be gathered using hashtags, as well. The teacher can encourage introvert students who are reluctant to speak before others within the classroom environment to ask questions and make those take part in the lecture given. Learning from Related Web Pages: Web pages related to the subjects being taught by the teachers are determined, and students are asked to take notes directly from those web pages. Then, the screenshots of the websites can be acquired using interactive applications like bounce. Students may open those screenshots later and enrich the content of the website by adding their comments. If there is only one tablet that students can use, they can study as a group. At the end of the lesson, the ones who enrich the content of the web page most are determined, and the lesson is finalized. Using Online Mind Maps: There are many online mind maps that are quite intelligible and detailed on the internet. Activities that are carried out via these websites are faster than those carried out by writing. Many students and teachers use MindMeister as its features are designed to satisfy their needs. Show the software on your smart boards, and then start brainstorming with your students to consolidate the subjects covered or to do a problem-solving activity. Launching this technology and integrate it into the lesson only takes a few minutes. Getting Feedback from the Students: Various questionnaires on the activities related to class content to encourage students about in-class activities can be prepared and delivered to the students either at the beginning, in the middle or at the end of the class. Filling out these questionnaires on paper might cause waste of both resources and time. Applications like Socrative, Google Forms, SurveyMonkey and Poll Everywhere can be used within the class momentarily to get various data or feedback from the students. This will enable the students to make use of their smartphones properly, and also let teachers carry out more interactive lessons. Teachers can enhance and revive their lectures based on the feedback received. Creating Editable Web Content with Students: There are lots of websites that enable users to edit their content like Wikipedia on the Internet. You can create a wiki page about the course content with your students, allow them to make changes on other students’ contributions and most importantly, have them engage in group study. Student Blogs: You can get students to type what they have learned during the courses from their own point of view daily or weekly. The teacher of the subject may check students’ blogs weekly and provide feedback. The most well-known blog site is WordPress. Open-Ended Project Suggestions: The students are presented with a suggestive list of projects and asked to select from this list. With this technique, students’ instincts are triggered, and they get the opportunity to show their knowledge. These projects may include creating web contents, combining e-books, making original art-work, composing musical melodies, making multimedia products etc. Students can make these products using lots of tools on the Internet. Tasks Focused on Technology: Sometimes, teachers are concerned about whether their students’ have the knowledge on how to use some specific technologies when they create a new product. As teachers, we can prepare our classes based on software and other technologies. For instance, students can write instructions explaining how to use their favourite computer software. For more challenging topics, they can make a research on how certain technologies affect different disciplines and create a report. You can introduce a very assertive way of using technology in the classroom environment, namely a game-based learning platform. Most of them are designed to motivate students to difficult topics. According to some researches, video games develop interbrain much faster. The application Prodigy can be used effectively to teach mathematics. This application is used in the USA and Canada to enhance students’ interest in mathematics and endear the subject.